I adore my iSkin Solo case for my iPhone (I have the bright blue one). I'll bet their cases for iPads are just as delightful. Well they are having a back to school contest where they are giving away an iPad case AND an iPad. Open to Canadian and US residents. Closes Sept 30, 2010. Go. Enter. Now. When I was in grade school, you know what was cool to bring your lunch in? That's right - your metal "Laugh In" lunch box. And when I got to high school, I toted my trusty Tupperware lunchbox - except mine was brown. Ugh - I was such a nerd. Luckily, your kids don't have to be. Our four fabulous kid bag recommenders from Tuesday chime in with their picks for great lunch boxes for kids! In terms of lunchboxes the Go Green is definitely our favourite. The Go Green is very very well designed to reduce lunch waste and is easy and convenient to use. It eliminates the need for plastic bags, extra containers, a separate water bottle, etc. Our customers absolutely love them and find that they pay for themselves very quickly. For young kids it is designed to be carried on its own. It fit in a bigger kids backpack - not in the Alpine Junior. But they are attractive and easy to carry. Well....I think I do love the ORE bags. The patterns and colours are so bright and friendly and I think that definitely makes lunchtime more fun - especially for the primary grades who still love all things cute. They have a velcro closure up top and have insulation. They are designed more specifically as a 'lunch-bag'. I think the size is also great and it fits easily into any backpack. My daughter has the Dabbawalla Ladybug Lunchbag so I have more personal experience with those. One of the things I love best is that they are so soft but waterproof so if something leaks, the backpack and its contents don't get soaked too. Plus they wash beautifully - nothing is ever stuck in the corners! The ladies who own the company are also super nice and easy to work with. If I were picking a lunch box to take to school now, I would likely choose Sue from Raspberry Kids pick. I love this pink giraffe! A very good customer of ours originally showed us the So Young Mother cooler bags and lunchboxes she had ordered and I immediately fell in love. The designs are simple, elegant and very natural looking. Mothers, fathers and kids can carry these with ease and they have an air of sophistication to them. As a parent, you are inundated with commercialized cartoon characters but my preference has always been to seek out independent designers and unique products and Catherine from So Young Mother fits that bill. It is also great to work with and support a fellow mompreneur. I wish my daughter's school didn't have a hot lunch program - well actually I don't, I love not packing lunch each day - but if they didn't I'd invest in a PlanetBox for non-toxic, litterless lunches. So there you have it … five great pics for lunch boxes for your kids. Hmmm .. I wonder if any of them will take my Laugh In box as a trade in? I feel like we're all in full tilt "back to school" mode. I know mainly because one of my favourite commercials is airing up here in Canada - the one from Staples where the parents are dragging the kids through the office supply store to get their back to school supplies singing "It's the Most Wonderful Time of the Year". My goal is to help your kids find a backpack and a lunchbox that your kids LOVE so they won't look as glum as the kids in the commercial. Now, I'm not an expert on kids' backpacks or lunchboxes - but I know where to find them. I got in touch with four smart entrepreneurs who specialize in bags (and other items) for parents and kids. Meet Annemarie from Yoyomama, Sue from Raspberry Kids, Judy from Mountain Baby and Stefanie from Dandelion Kids. I got great bag and lunchbox anecdotes and recommendations from all of them. Today, I'll share the backpack stories - on Thursday, the lunchbox ones. I've always been a bit of a bag lady and I still have my pre-kid collection of handbags both small and large, each of which had a specific purpose and use. Once I had my kids my new obsession became diaper bags (I was a Fleurville Mothership fan). And because I had two girls, many of my less used purses have ended up in their dressup box so when I took my oldest to buy her first backpack for kindergarten I was interested to see which bag she'd choose. Something had obviously been carried through her genetic makeup as she picked Fleurville's Kid's Messenger which is both a backback and messenger bag. It lasted with aplomb through kindergarten and grade one but now she's in the market for a new bag. I'm very aware of backpack safety when it comes to kids so I may try and steer her towards something a little smaller that won't weigh her down quite as much. For plane trips she's been carrying Mountain Equipment Co-Op's Dome Daypack which doesn't carry a tonne but is perfect for some crayons, a water bottle and a few treasures. 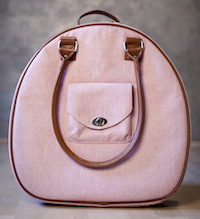 Sue from Raspberry Kids told me about one of her favourite kid-sized backpacks - those from Beatrix NY. Beatrix NY (formerly Dante Beatrix) was a bit of a discovery for me and Raspberry Kids. We were one of the very first retailers in Canada that carried this line and we worked very closely with the supplier to help build their presence in Canada. They quality is amazing and the cute factor is through the roof. Everytime they come out with a new style or product, it brings a smile to my face and I adore each of the Maakun forest critters names such as Percival the Dino, Esther the Bunny, Jean-Pierre the Squirrel. Just like the little and big kids that carry these backpacks, they each have their own personality and amazing expressions. We've just been given a sneak peak of a new design that is launching soon and we will definitely be adding them to our offering. When design and function meet, you cannot go wrong! Another important reminder on kid safety and backpacks came from Judy from Mountain Baby. Then she and her team put their heads together and picked their favourite backpack. When we sell backpacks to parents we indicate that for back health children should not carry more than about 15% of their weight - not very much really. And we emphasize that parents need to take a stand on behalf of their kids' well being and let teachers know that young children should not be overburdened with heavy backpacks that strain their backs! The packs come in a variety of kids colours and are rugged and designed to last through several kids, rather than falling apart in a few months and needing to be replaced. Had a discussion with the staff and we all decided that the Alpine Junior is our favourite pack for the younger children off to day care and kindergarten. It is designed to cover every day basics for a day out including an extra fleece, books, crayons, water bottle, lunch ( in a small lunchbox or bag) etc. It is not designed to carry a large binder, but this is not an issue for the younger crowd. Finally, Dabbawalla was the backpack that Stefanie from Dandelion Kids chose as her favourite for younger kids. Bright, modern graphics adorn both the backpacks by Dabbawalla. Dabbwalla bags are made in Taiwan crafted by sewers who earn fair wages in safe working conditions. The backpacks are soft, sized perfectly for children and have a dual function perfect for active kids - grab and go on the run or wear as a comfortable backpack. Cushioned, flexible straps adjust from the inside and can be pulled tight when not in use. So now you have some ideas for how your kids can be funky, chic, cool AND safe in their choice of backpack. Many thanks to the moms who gave us these great recommendations for funchico backpacks for kids! You'll hear from all of them again on Thursday when they discuss lunchboxes! 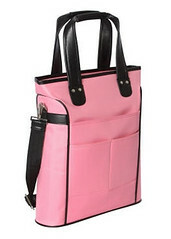 The Allie Laptop Tote from Rainebrooke - a Pink Sensation! The front of the Allie Tote has a large pocket with a place for pens and business cards. The pocket has a snap closure. And, yes, you guessed it. That means when I need to fetch a pen, I put my tote on the floor, and I bend and snap! (Get it? Get it? It’s the bend… and snap!) Two smaller pockets are layered on the outside of the snap-pocket provide access in a pinch. There’s no need to go digging through the depths of a bag. The Allie tote features a deep, zippered pocket on the outer back panel. Perfect for stashing a little cash for a French manicure! Or perhaps a passport and boarding pass for a trip to Aruba? Check out my full review of the Allie Laptop Tote from Rainebrooke. And if you decide to buy, don't forget to come back here for a coupon to use at Rainebrooke! I know, I know ... we don't do enough man bags. Well here is a laptop bag and hearty travel bag that any man (and a few women) would be glad to tote around - the Jett Laptop Bag from Spire. I'm pretty sure that airlines are out to get me. Whenever I have a connection to make, it never fails that my plane arrives late, and I have five minutes to catch my connecting flight. I will then discover that my gate is located in what must be the next time zone. 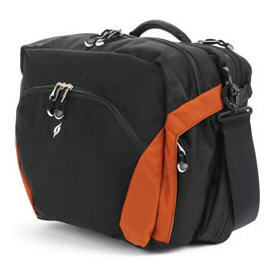 Ah, but never fear, the Jett Laptop Bag from Spire USA is here! Okay, so the Jett laptop bag it won't teleport me to my gate, but it does make traveling just a little bit easier. Many thanks to Cory over at Spire who sent one to check out! There are a lot of things I like about this laptop bag, but as a frequent traveler, my favourite thing about the Jett is that it's "checkpoint friendly." It opens like a clamshell so that my laptop can be scanned at airport security without having to remove it from the bag. And, even if the security agent makes me remove the laptop from the bag, the laptop compartment is easy to access with a side zipper. Check out the full review over on Cool and Stylish Laptop Bags for Men. Lexie Barnes Summer Blowout Sale! If you have been holding out on getting your hands on a Lexie Barnes tote, bag or case - now is the time. She is having an INCREDIBLE sale on her summer stock to make way for the fall line. All of these bags, and more, are on sale at lexiebarnes.com. Her Betty knitting needle case is a steal at $10. I haven't seen it in person (though I have the Coco) but you can see a picture of the Betty's interior - how perfect is this case?!? Use SQUIDOOSHIP for free UPS ground shipping in the continental U.S.
Use SQUIDOOROX for a free gift. I don't have an iPad. But I would like to eventually get one. And when I saw the DODOcase for them, I KNEW that's what I would get. Because I love my Moleskine notebooks as much as I love my tech. My DodoCase has been my most eagerly awaited peripheral ever. Almost as awaited as the iPad itself. Fortunately, I didn't have to wait 15 years for the DodoCase, merely six weeks. I'm not sure how the economics works of making hand-made cases in San Francisco for $50, but it is a good deal. Just be aware that shipping to Canada will add another $25 (yes, shipping internationally is half the price of the case). The case itself works so well at disguising my iPad as a Moleskine notebook that even folks who knew about it were surprised. Great for reading RSS feeds on the bus! To complete the feel of an artist's notebook, I have added a Pogo Sketch stylus to the ensemble. The case adds very little weight to the iPad, but makes it feel much more secure in the hand (harder to drop, and more resilient if you do drop it). It allows the iPad to be propped up for viewing or typing (portrait, landscape, or landscape in the lap slightly raised for typing). There are cutouts in the bamboo edge for easy access to all buttons and the dock connector. Overall, very pleased: this case makes my iPad better. You can see more great photos of the DODOcase, including how to use it as a stand, over on their site.